Checking out Lake Geneva vacations? Look no further! A vacation package at our romantic Lake Geneva Hotel will put the spark back into your relationship! Your Lake Geneva vacation package can also include relaxing massages, flower bouquets, tempting picnic dinners delivered to your suite, luscious desserts, decadent chocolates, and even breakfast in bed! There are many different choices for Lake Geneva vacations. If you are looking for a place to take your children with you, ours isn’t the one. 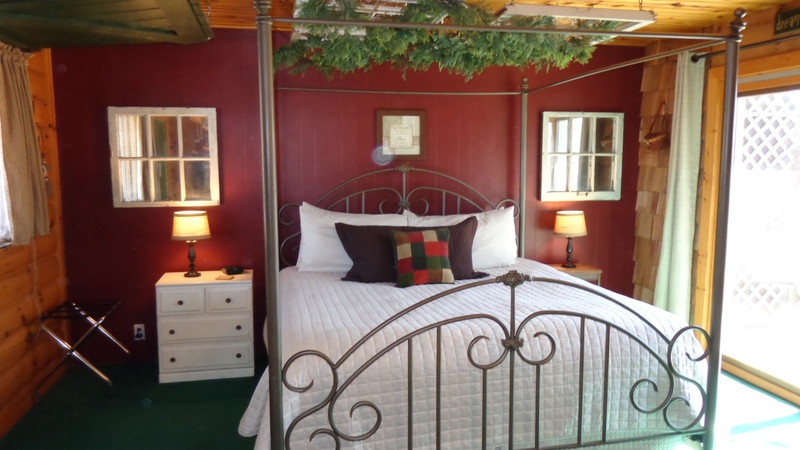 But if your looking for a getaway with your sweetheart, our romantic country Inn will have you falling in love all over again! The romantic ambiance of the Dreamcatcher suite makes a perfect choice for memorable vacations! Golden oak logs make the Dreamcatcher Suite glow with the warmth of an elegant log cabin. The spacious suite is decorated with the colors of Mother Nature – greens, browns, tans and accents of mulberry. There are sliding glass patio doors in the bedroom and the sitting room with great views of the woods to be enjoyed on your romantic vacations. Facing the couch is an entertainment center decorated with birdhouses, duck decoys and lodge decor. A pub style table and chairs provide a great place to sit and talk as you enjoy breakfast in the morning. You will also have a wonderful view of the woods through the second set of patios doors. Above the couch and double whirlpool, a canopy of mini white lights and evergreens adorn old, wooden window frames which makes this suite one of Lake Geneva’s popular romantic vacations. The corner fieldstone fireplace can be viewed from the bed, the couch and the whirlpool.